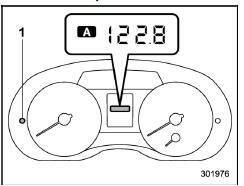 This meter displays the two trip meters when the ignition switch is in the "ON" position. The trip meter shows the distance that the vehicle has been driven since you last set it to zero. If you press the trip knob when the ignition switch is in the "LOCK"/"OFF" or "ACC" position, the odometer/trip meter will light up. It is possible to switch between the A trip meter and B trip meter indications while the odometer/trip meter is lit up. If you do not press the trip knob within 10 seconds of illumination of the odometer/ trip meter, the odometer/trip meter will turn off. Also, if you open and close the driver's door within 10 seconds of illumination of the odometer/trip meter, the odometer/trip meter will turn off. The display can be switched as shown in the following sequence by pressing the trip knob. *: They cannot be displayed when the ignition switch is in the "ON" position. To set the trip meter to zero, select the A trip or B trip meter by pressing the knob and keep the knob pressed for more than 2 seconds. To ensure safety, do not attempt to change the function of the indicator during driving, as an accident could result. If the connection between the combination meter and battery is broken for any reason such as vehicle maintenance or fuse replacement, the data recorded on the trip meter will be lost.